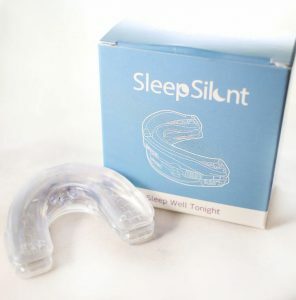 I’ve been snoring for years and have tried a lot of anti-snoring devices, including nasal dilators. Nasal dilators are small inserts made of a rubber-like material that you insert into your nose before going to sleep. They open up your nasal pathways, which prevent you from snoring. Nasal dilators are different from snore guards that go in the mouth, such as the zQuiet, as they are inserted into the nose. They can be worn in tandem with a snoring mouthpiece. Depending on your physiology, nasal dilators can be an effective way to treat your snoring. I tested the Rhinomed MUTE Nasal dilator and found it works reasonably for snoring and especially nasal snoring. The Rhinomed MUTE Nasal Device is an advanced nasal dilator that is available in three sizes. It is designed so each size can be further adjusted with micro-adjustments, making it a one-of-a-kind custom fit. I was excited to test out the MUTE, as its maker, Rhinomed, also makes breathing devices for high-performance sports professionals. My hope was that if the pros like this product maker, maybe I would too. Mute gently stents and dilates the nasal airways allowing snorers to breathe more easily through their nose and keep their mouth closed during sleep. By opening up the nasal passages, the MUTE reduces the vibrations in the airways that can cause disruptive snoring. The unique shape of the MUTE allows it to sit towards the back of the nasal passages, creating a wider opening in the back of the nasal cavity than most nasal dilators. Based on the descriptions of the sizes, I ordered the large size of the MUTE. I was impressed when I opened the box. The MUTE comes in a nice package with a very professional design and presentation. First impressions are important, and so far, the MUTE was doing well. Despite my research, I wasn’t positive I had chosen the correct size. It was only later that I saw that Rhinomed sells a trial pack which has multiple sizes in it for new users. The trial pack allows new users to determine which size works best for them. That makes sense and I probably would have purchased the trial pack had I realized it was available. I bought mine from the official MUTE site, but discovered the MUTE is also available at Walgreens, so I could have picked it up there. Inserting the MUTE into my nose was not as straightforward as I would have hoped. The MUTE comes with detailed instructions and you really do need to read them to understand how to put it in. After reading the instructions, I was able to insert the MUTE into my nose without looking in the mirror. Because the device was inside my nose, it was hard to tell if the MUTE was inserted like the picture. I did not notice any discomfort until I accidentally pushed the device too far into my nose. I like to use the SnoreLab app when I’m testing out new anti-snoring devices. The SnoreLab app records your snoring through the night and measures your snoring duration and intensity. I fired up the app prior to going to bed. I slept well- I really didn’t notice the MUTE was in place. I fell into a deep sleep almost immediately that night. When I woke up the first morning, the first thing I did was check the SnoreLab app. I noticed that 28% of the night was spent snoring – slightly higher than my long-term average. However, I was surprised when looking at my Snore Score, which is the app’s way of measuring snoring intensity. My Snore Score had dropped all the way to 12. Now normally, when I have a night of deep sleep, my Snore Score can get as high as 60. So, although I snored the same amount of time, the overall volume of snoring was much lower than usual. I listened to the recording and the snoring was hardly noticeable. I tried the MUTE for the second night and noticed on waking that my Snore Score jumped to 33 from 12. Fortunately, the SnoreLab app had picked up the sounds from the heavy rains we had. The rain was showing up as snoring, which explains the jump in the Snore Score. This is one reason I like to use the app! I tried the MUTE again on different nights and had good results. I was able to increase the size of the device with the handy straps that are built into the dilator. A lot of factors that a nose dilator can’t control were at play for me and caused variation in results. For example, external factors such as deeper sleep, using sleeping pill, and eating various foods prior to bed that cause GERD caused types of snoring that the MUTE could not fix completely. Overall the MUTE is a quality product that reduces snoring volume. 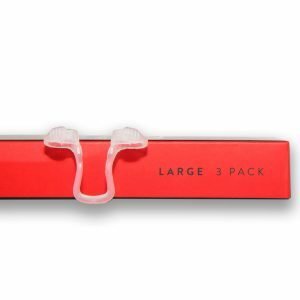 It is the most professional Nasal Dilator we have reviewed due to the precise sizing ability. Many nasal dilators we’ve tried show no results, but the MUTE was successful in our tests. Lowers Snore Volume. If your problem is that your snoring is too loud (and really, who doesn’t have that problem? ), the MUTE will work well for you. I saw a noticeable drop in the volume of my snoring at times with the device in place. Size Options. Everyone’s nose is different, and the MUTE recognizes this. I appreciate there are different sizes available (try the trial pack!) and you can further customize the sizing with the built-in straps. Making it adjustable for a custom fit is a huge plus. Compact. 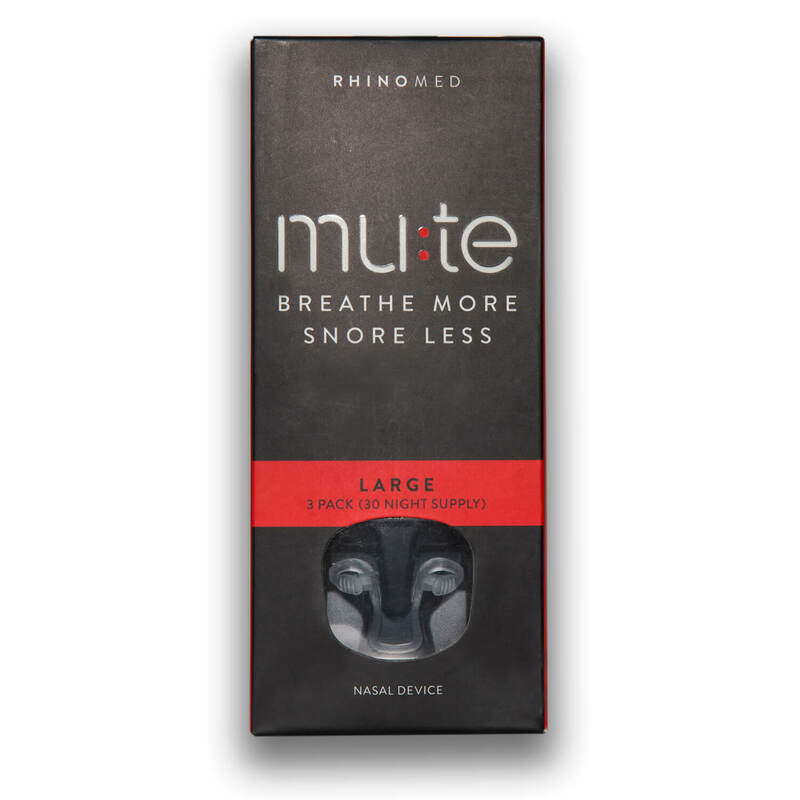 The MUTE is small and compact, making it an easy anti-snoring tool for people who travel or are on the go. Doesn’t Prevent All Types of Snoring. The MUTE only works on nasal snoring. So, if you snore because of weight or alcohol, the MUTE might not solve your snoring problem. Daily Maintenance. The MUTE needs to be washed daily, so it’s one more chore to keep track of in your nightly routine. The small and moving parts of the device make cleaning harder. Nasal dilators like the MUTE are straightforward and efficient tools at reducing your nasal snoring. I found the MUTE to be effective at reducing the volume of my snoring, which was a big bonus. It did not, however, reduce the actual amount of snoring as much as I would have liked. The MUTE is a relatively inexpensive way of testing out a nasal dilator and may be an effective tool for you if you are a mild to moderate snorer.